Magic and elemental attacks won't work well against these confounding casters. Know what will? Keyblade to the face. Watch out when the cubes they've conjured change color; that means pain is incoming. But then, when are ethereal objects glowing red a good sign? The Sorcerer is a high-ranking Nobody controlled by Xemnas that was introduced in Kingdom Hearts II. A Sorcerer Nobody is mostly light grey, save for a small area on either side of its waist, which is a darker color, and some black markings. It appears to wear a long robe that covers almost every part of its body, including its face. The Nobody's hands are seemingly permanently connected by the sleeves of the robe, and its individual arms are only distinguishable by the black seam of the sleeves. The Sorcerer's head sports a black cross pattern that wraps around the back of its head, and its shoulders are pointed. 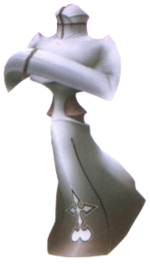 The lower half of the robe is mostly featureless, except for a few stray black markings and a white Nobody emblem at the bottom. Sorcerer Nobodies share the dumbfounding level of flexibility all lesser Nobodies have, and they constantly pulsate for some unexplained reason. The Sorcerer is based on the eponymous job class from Final Fantasy. The Sorcerer uses magic cubes which hinder melee attacks, and it lacks a Reaction Command. The battle can be shortened by using Reflect at the right moment to inflict significant damage. A well-timed Reflect can destroy a Sorcerer in a single blow. It also has an attack during which it clubs Sora with its cubes, use Reflect. Another strategy makes use of the fact that Sorcerers are immune to most forms of magic with the exception of Magnet. Use the Magnet spell to stun it, and attack quickly. Beware of its magic cubes, if doing this. Also, one can avoid the cubes with a well-timed attack. In addition, when the Sorcerer appears, it usually does so without cubes. Take that opportunity to attack. If timed right, the Sorcerer will be defeated before or as the cubes arrive. One other strategy that works well is to change into Final Form (if it has been acquired). If Sora is in Final Form before fighting a Sorcerer, then he can attack with extremely quick aerial combos. It will be defeated before its cubes arrive. Oddly, it is the only Nobody that does not move from its posture when fighting. It always holds the pulsating appearance (even when attacked, the Sorcerer will still hold its posture aside from blows).